Tindari is a tiny suburb of the district of Patti, in the province of Messina, first built by the tyrant Dyonisus of Syracuse (with the name of Tyndaris) as a colony and best known for its two main fascinating features: its sanctuary located on a hill rising at 180 meters above sea level and its white sandy lagoon brushed by the cyan waters of the Tyrrhenian sea. This small and charming town is located on the Northen coast of the island, where we picked some of our beautiful Sicily villas with a view on the sea. 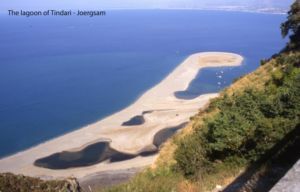 Situated on the easternmost point of the hill, overhanging the sea, the Sanctuary of Tindari was built where the ancient acropolis was once located, and is dedicated to the Black Madonna of Tindari: the view is just breath-taking here, as the sanctuary overlooks the whole North-Western shore until Capo Milazzo. The beautiful lagoon can be also seen from here, but we highly recommend you visit it: a sandy strip of land surrounded by transparent water, perfect for a relaxing day at the beach, and overloaded with legends and mythology – one of the legends says that the lagoon was created when a pilgrim, who had reached Tindari in order to pray for the Madonna but then refused when she saw that the Madonna was black, dropped her baby into the sea: the Holy Mary is said to have raised that strip of land in order to save the pilgrim’s baby. The archaeological area is also quite interesting (and not far from the lagoon): plenty of evidence from the ancient Greek colony can be observed here, from a splendid Greek theatre, still used as a set for shows and plays, to the basil and the city walls.